Cloud Services - A Leap in Technology or Simply Outsourcing? 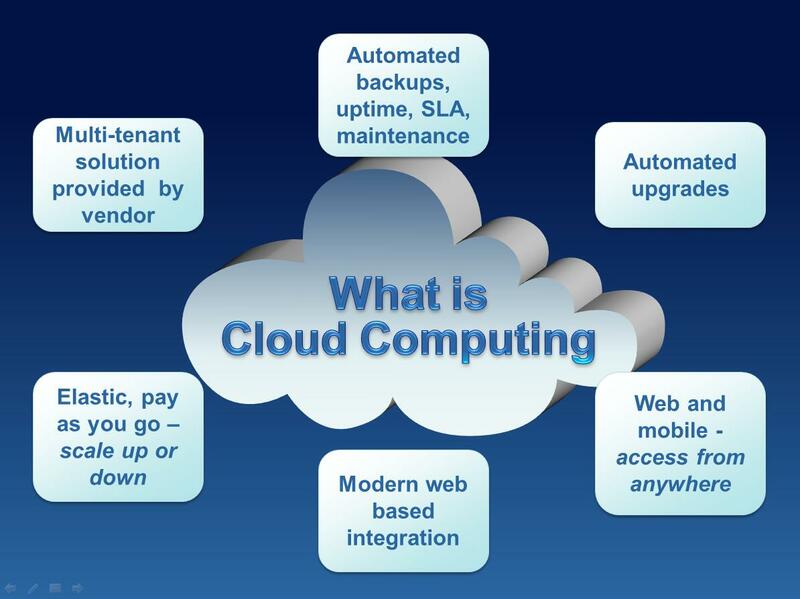 Cloud Services – is it the next step in technology or is it just outsourcing your IT needs? While the practice of keeping your equipment in a remote location (commonly referred to as “Co-Location services) has been around for some time, the actual benefit is up in the air. Yes, co-location does provide some added piece of mind. Typically “Co-Lo” facilities come with emergency power supplies, diesel generators, battery backup, 24 hour security, etc. Sounds good, and you can probably save some cap-ex costs by not having to build the power grid yourself. Throw in the added value of saving the real estate costs of housing it yourself and co-location seems like a reasonable way to go. With cloud services, you get all the benefits of co-location, plus a lot more. No longer are you using your own servers, paying your own maintenance fees, or paying the salary of the IT guy to visit the co-lo site every time you need to change some hardware. Using cloud services gives your company the benefit of state of the art, enterprise grade equipment with 24x7x365 on-site monitoring. With the right provider, your data is automatically backed up at multiple data centers across the country, providing true disaster recovery protection. If you live in Boston, your data could be backed up in California. It would take quite a disaster to reach across the United States! If you need to add hardware, you visit the web portal to the server on your local PC, make a couple entries on a web page and Voila! You have additional server space within a few minutes. No longer are you dependent on waiting for a new server to be built and shipped from your vendor. I’ve seen this take process up to 4 weeks. Sure they do. We all do. Cloud services doesn’t need to reduce headcount. The use of cloud services simply changes the focus for your IT staff, allowing them to concentrate on issues critical to growing your business, rather than maintaining it. By removing the daily chore of monitoring the platform and network, they now have the time needed to create the new software program your marketing group has requested; they can finish the bandwidth reports your CFO has been waiting for to evaluate network costs. There are loads of projects they can do. Take a quick look at the IT task schedule at your next staff meeting. There’s plenty to do……. The age-old saying “Time is Money” comes back into play and creates more revenues for your company because the use of cloud services will add time back into your IT staff’s day. It may even save you some money too! If you’re interested in more detailed information on the benefits of cloud services for your business, please reach out to me via email dave@davehanron.com or via Twitter @DaveHanron. I can also tell you how you can get a free 30 day no-risk trial in the “Cloud”. We’ve all heard the phrase “VoIP” but how many of us really understand it? Let’s start with the definition….”VoIP” stands for “Voice Over Internet Protocol”. Ok everybody knows “VoIP” now, right? Lots of today’s companies throw around “VoIP” as a buzz word in their marketing efforts. Ever heard of Skype, Magic Jack, and Vonage? They are all over your television and they all use VoIP technologies. Next question…..What is “Internet Protocol”? Wikipedia defines “Internet Protocol as……. "the method used to take a human voice and convert it to a digital signal which can then be sent across the caller’s internet service to another person and then converted back to a human voice"
VoIP is to the telephone as HDMI is to your TV signals. We’ve all lived the latest craze to convert from analog TV to digital TV. But I think we all agree our picture is better with digital & high definition signals! As VoIP technology continues to evolve, the voice quality will also reflect similar advances in quality. If you tie one end of a rope to a tree 100’ away from you and shake it, you will see the rope move in a wave type motion, with bigger waves closer to you and diminishing waves as you get closer to the tree. Imagine this is your voice. If you call your neighbor, you’re very close and your voice sounds great. If you call you cousin in Europe, they are at the other end of the rope and your voice sounds weak and far away. Now take a picture….if you gave one to your neighbor next door and one to your cousin in Europe, the picture looks exactly the same. No deterioration of quality between the two. Same theory works with your voice on digital service. VoIP technology is layman’s terms, takes a picture of your voice and transmits it to the person you are calling. No reduction in sound quality. VoIP has a great future and it looks like we’ll all soon be using it for better or worse. If I can answer any specific questions, please enter them in the comments sections and I’ll be happy to respond.